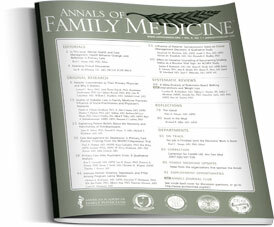 The Annals of Family Medicine is a peer-reviewed research journal and publishes original research, methodology, and theory as well as essays from reflective clinicians, patients, families, communities and policymakers. The journal is dedicated to advancing knowledge essential to the understanding and improving health and primary care. This publication supports a learning community of those who generate and use information about health and generalist health care, this includes scientists, practitioners, policymakers and the patients and the extended communities that they serve. The Annals seeks to identify and address important questions in health and the provision of patient-centered, prioritized, high-quality health care and encourages practice-based research and research that bridges disciplinary boundaries. The Annals welcomes print classified and online recruitment advertising only. All advertising in this publication runs in conjunction with advertising in Family Medicine. Interested in online medical recruitment advertising for faculty recruitment? Learn more about the Family Medicine Careers job board.